Holidays can be hard for any number of reasons. But with the intense focus on food and meals, they can be especially challenging for parents of children with extreme picky eating. All will be fodder for the Thanksgiving and Holiday tables. Your feeding (thus parenting) may feel in question. What to do? Your family may intrude, say or do the opposite of what you are trying to accomplish with feeding, eating, or body-image. Other than boycott Thanksgiving (which is an option), here are a few tips to surviving— and hopefully enjoying the Holiday Table. We’ve also thrown in some “script” ideas to have on hand just in case! The phrase we have found particularly useful with family is, “Please follow my lead.” They don’t have to understand, agree with or actively partake in your feeding philosophy, but you can ask them, “follow my lead.” If you have a pattern of meddling family trying to get your child to eat more, less, try foods, pressure, shame, or bully, step in with a polite but firm, “Mom, please follow my lead with this.” Try not to explain or draw more attention, or argue the issue during the meal. 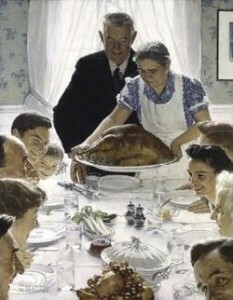 Before the meal, try to find a moment to talk with and prepare family. “Mom, we are trying something with Susie and her eating. She is expected to be polite and participate, but we are allowing her to chose what foods and how much she will eat from what is on the table. Please don’t ask her to eat more, and also, don’t make a fuss or praise if she does eat something new. I know it’s not how you would handle it, but I hope you can just follow our lead.” (Use those words in your preparatory explanation.) Then a brief reminder when they slip up should be enough (but let’s face it, it might not be…) They will slip up and that’s not the end of the world. With repeated reminders, hopefully they will back off. Remember too, what happens the other 300-some days of the year matter most. Even our parents (Jenny & Katja’s) after years of hearing about our approach to feeding, still on occasion fall into habits we don’t like. With this catch phrase, they know to back off. If others suggest your child shouldn’t have dessert until he’s finished his meal, try “He’s doing fine. He can have his dessert now.” When your child hears you defend him in front of others, it sends a powerful message of trust and gives him words to use to stand up for himself. It amazed a client the first time her daughter confidently refused food pushed on her by a friend’s mother, saying, “No thank you, my mom says I don’t have to eat anything I don’t want to.” Teach that phrase to your child. But you may have to step in. If someone is truly pushing, forcing or shaming your child into eating or trying a food, you don’t have to be polite. A firm, “Stop that” should help. There are often safe foods, like rolls, mashed potatoes, plain chicken breast… But there are also challenging mixed foods like stuffings, veggies dishes and pies. Consider bringing a “safe” side-dish, rolls, or dessert or appetizer so that your child has something he can eat. Bring bags of chips or crackers he is likely to eat, along with dip. Make plain mashed potatoes, or bring a pie and vanilla ice-cream (without the little vanilla specs he doesn’t like) so he can participate in dessert. 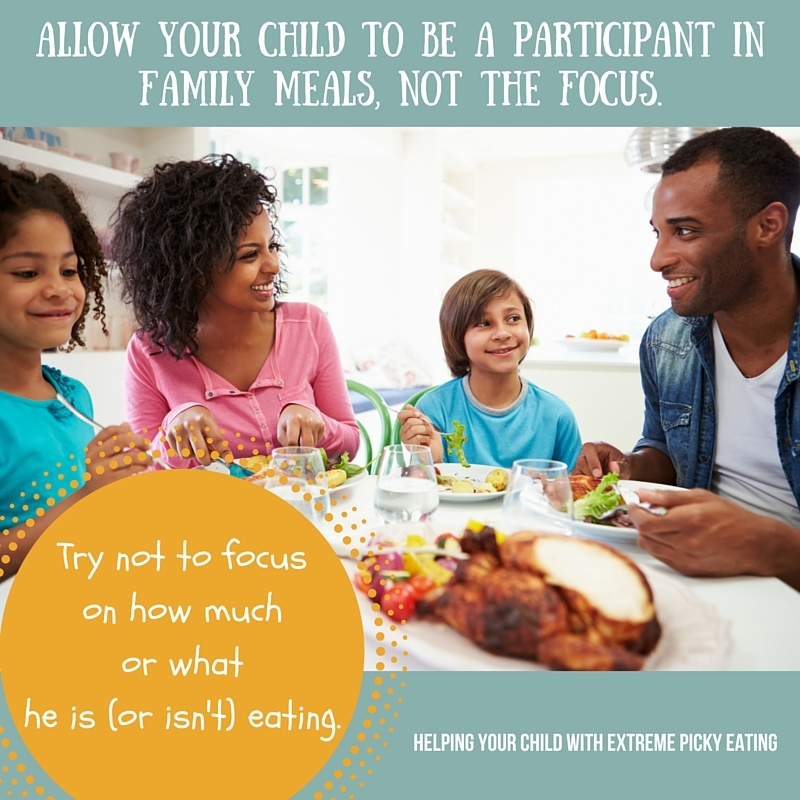 Let your child be a participant, not the focus of the meal. Start a new tradition where everyone says two things they are thankful for. Focus on the company, not the food. Along with safe foods, maybe find a place where your child can go if he feels overwhelmed. Show him a nearby bedroom or office where he can go with a book or an iPad and Minecraft if he needs some quiet time. You might check in with him now and then and take a short break together. Maybe a bedtime snack of safe foods is on the schedule so your child knows he will have a chance to eat when he gets home. And remember, your family just might surprise you. Go in hoping for the best, with deep breaths, but be prepared. Maybe they will follow your lead if you can sit down to Holiday meals with a smile and the intention to enjoy the company.